About 10-15% of many common cancers are due to genetic changes, called mutations, that are passed down through families. Color is a simple test that looks at changes in 30 genes, including BRCA1 and BRCA2, to help you understand your genetic risk for breast, colorectal, melanoma, ovarian, pancreatic, prostate, stomach, and uterine cancers. Using this information, you can work with your healthcare providers to develop a personalized screening plan. Purchase your Color Test and we will ship it right to your home. Once received, go to www.color.com/activate to activate your test. Provide your saliva sample from the comfort of your home. Mail it back to Color in the same box it came in using the prepaid postage. You will receive your confidential results online after they are reviewed by a certified medical professional. We also make it easy to share and discuss your results with your doctor so that together you can create a screening and prevention plan designed for you. 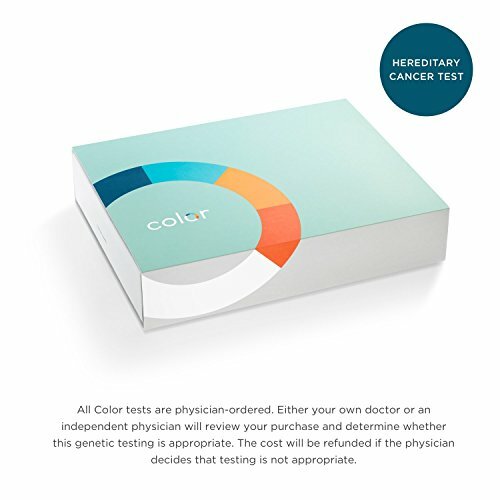 In addition, you will be able to make an appointment with one of Color's genetic counselors at no extra cost. Note: A portion of this fee will be applied towards administrative costs collected for an independent physician to review your information and determine whether testing is appropriate. If the test is not ordered, total cost will be refunded. At this time state regulations don't allow us to ship the Color Test collection kit to NY State addresses through Amazon. However, you can email us directly at support@color.com for alternative ways to purchase the Color Test. At this time state regulations don't allow us to ship the Color Test collection kit to NY State addresses through Amazon. If you have any questions about this product by Color Genomics, contact us by completing and submitting the form below. If you are looking for a specif part number, please include it with your message.